Antabuse (disulfiram) is a medicine available by prescription used to treat chronic alcoholism. It works by causing a number of very unpleasant body reactions when some alcohol is consumed – such as mental confusion, flushing of the face, breathing difficulty, anxiety, chest pain, nausea, vomiting, sweating, choking, headache, blurred vision and weakness. These effects can appear as soon as 10 minutes after some alcohol is consumed and can last for up to an hour. Therefore, this medicine will not cure the condition itself, but will discourage drinking in most patients that otherwise do not have the will to deal with the habit. This medicine must never be given to a person in a state of alcoholic intoxication that doesn’t know what this medicine is intended for. Antabuse comes in tablets for oral administration and should be taken one time a day unless your health care provider decided otherwise. The tablets can be crushed and mixed with some drink – coffee, water, juice or milk. Make sure at least 12 hours pass after you had a drink to take Antabuse safely. 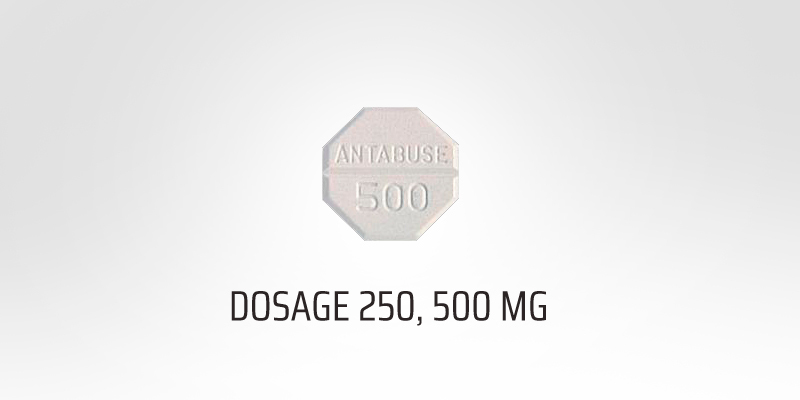 The starting dose of Antabuse treatment should not exceed 500 mg per day. People usually take 250 mg daily for alcohol addiction treatment. However, you need to be aware of the fact the effects of Antabuse can be felt during up to 2 weeks after you have stopped the treatment. Try to avoid drinking alcohol during this period. Before you start the treatment your health care provider needs to know if you are allergic to Antabuse, as this can make it impossible for you to take this medicine. Any health conditions you have ever been diagnosed with also have to be reported, including thyroid disease, brain damage, kidney or liver disease, diabetes or epilepsy. In that case you may require a dose adjustment or your condition will be closely monitored for any side effects related to the treatment. Antabuse can make some people drowsy. Make sure you do not get engaged into any activities that require concentration, as otherwise an accident might happen. Make sure you know which products contain even the smallest amounts of alcohol to avoid using them and having the unpleasant results described. Some products that contain alcohol include vinegars, cough and cold medications, colognes, perfumes, antiseptics, mouth washes and some sauces. Antabuse can cause side effects that are generally mild. The following ones are most often experienced: skin rash, mild headache, drowsiness, acne, tiredness and impotence. Tell your doctor about these side effects only if they persist or begin to bother you too much. More serious side effects are also possible and you need to be aware of them. In case you experience extreme weakness, yellowness of the skin or eyes, loss of appetite, upset stomach, lack of energy, vomiting or dark urine, contact your doctor immediately and do not take any more of Antabuse until you have discussed all the possible steps to be taken to make this side effect disappear. Antabuse is FDA category C. It is not known for sure whether this medicine can affect the health of an unborn baby, but it is known that it can pass into breast milk and affect the health of a nursing infant. In case of being pregnant or breastfeeding make sure you discuss all the risks and benefits of the treatment with your health care provider. In case of a missed dose take it as soon as you remember and take the remaining doses at evenly spaced intervals. You can go back to the dosing schedule recommended the next day.